Apple is working on an iOS app intended to funnel people through the support process faster, as well as address a lot of questions without phone calls or looking it up on the company's website, it was revealed on Friday. 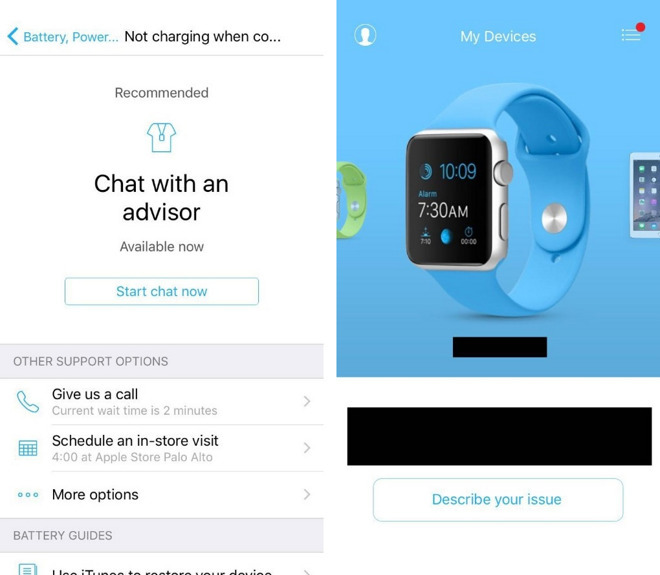 When troubleshooting the app asks a user basic questions in order to determine the problem, and offers options for booking a Genius Bar appointment, sending a device in for repairs, or calling/chatting with a support representative, according to uSwitch Tech. The details stem from a source connected to Apple's Cupertino headquarters, as well as images supplied by well-known leak middleman Sonny Dickson. The app also includes a number of self-help guides, which deal not only with glitches but general use. The anonymous source noted that once a person is logged in, the app is aware of all devices registered to an Apple ID. It will also ask whether a device is on the latest version of iOS, and where relevant offer to contact a carrier when it comes to iPhone/iPad issues. Though all of these options are available elsewhere, the upcoming app should unify and streamline them with some additional perks. When considering an AppleCare call, for example, the app displays an estiamted wait time. uSwitch said that it's unknown if Apple is working on a fully standalone app or planning to integrate the support features into the Apple Store app. The latter currently lets users book Genius Bar appointments, but nothing more.